Do vegetarians and vegans have an increased risk of B12 deficiency? Are there vegan vitamin B12 food sources that contain enough of the vitamin to make a meaningful contribution to the overall supply? What vegetarian and vegan options are available? Which is the right dietary supplement for vegans? In regards to vitamin B12, there is no question more intensely debated than whether or not vegans and vegetarians depend on B12 supplements. Yet why is this such a hot topic? Ultimately, this discussion lies at the heart of other debates, mainly those concerning which diet is really the most natural for humans. Vitamin B12 is integral to this discussion. For example, if a vegan or vegetarian were to incur a vitamin B12 deficiency and had not been supplementing their intake, a meat-eater might consider this proof that such dietary choices are unnatural and unhealthy – a direct result of not eating meat. However, some vegans strongly disagree and try to prove otherwise. In our opinion this discussion about “natural nutrition” completely misses the point, as veganism and vegetarianism are usually adopted for ethical, ecological and health reasons anyway. A healthy supply of vitamin B12 has many benefits; on the flip side, the health risks surrounding B12 deficiency are very serious and should not be viewed in light of an emotional discussion, but rather from a matter-of-fact nutritional perspective. Is a vegetarian/vegan diet healthy in general? Is a diet containing meat, fish and dairy products healthy? Which advantages and disadvantages are there? Is a supplementary intake of B12 in a vegetarian/vegan diet particularly advisable? It has now be extensively proven that vegan/vegetarian diets can be incredibly healthy. In addition to this, most health experts and health authorities recommend vegetarian and vegan diets as particularly beneficial to health – providing, of course, that a balanced, comprehensive range of foods are consumed (1). Certain illnesses are found to heal quicker when a transition is made towards a more plant-based diet, particularly cholesterol related diseases and so-called lifestyle diseases suspected to be closely associated with excessive meat consumption. But what is now equally clear, is that vegetarians and vegans especially should pay careful attention to their vitamin B12 intake. This article will provide more detailed information on this topic. Official recommendations advise that adults require between 1.5 – 2.4 μg of vitamin B12 per day. In our opinion, the actual intake should be much higher in most cases. This is due to the fact that the absorption capacity in most adults is less than ideal; a large amount of the ingested vitamin goes unabsorbed and is simply excreted. Vitamin B12 is found almost exclusively in animal foods and is most concentrated in offal, where anything from 65 μg to 100 g can be found. Offal has become increasingly unpopular and is of course not eaten by vegans and vegetarians, which has resulted in higher risks of deficiency. It is also worth pointing out that often the sources considered high in vitamin B12 – beef, pork, chicken and fish – usually only provide relatively small amounts. Long-term studies have shown that those who do not eat large amounts of these foods and possibly require an increased amount of B12 (e.g. due to stress) or have a weakened absorption capacity, can quickly become deficiency despite eating meat (2). Whist the ovo-lacto form of vegetarianism contains two very potent sources of B12: cheese and egg, there are no scientifically-approved vegan dietary sources which contribute to the B12 supply. Vegans are thus advised to take nutritional supplements. This is even recognised by the international Vegan Society, who have brought out their own range of supplements called Veg1. They recommend taking a daily supplement containing a minimum of 10 μg of B12, or a weekly supplement containing at least 2000 μg. In addition, they advise eating fortified foods (3). Which B12 Supplements are Suitable for Vegetarians and Vegans? For dietary supplements, we recommend that you purchase products from reputable sources, which are as pure as possible – containing no dyes or additives. Capsules are almost always a reliable choice, yet care must be taken that they contain no gelatine or lactose. When it comes to vitamin B12 forms and choosing which active ingredient is best, the natural B12 forms methylcobalamin, adenoslycobalamin and hydroxocobalamin are highly recommended. All three forms have independent effects in the body. Daily supplement doses of 250 – 500 μg per day are recommended. If an individual suffers from malabsorption or an existing deficiency, 1000 μg per day is advised. Many studies have looked into whether vegans and vegetarians are more likely to suffer from >>B12 deficiency<< than omnivores. The results are quite conclusive: an undersupply amongst vegans is extremely common and there are, statistically-speaking, significantly more vegetarians with a B12 shortage than omnivores (4 – 6). In the elderly, the figures for omnivores and vegetarians become increasingly similar. On the other hand, vegans have an extremely high deficiency risk at all times (7, 8). A popular argument from vegans is that the number of B12 deficient meat eaters is much higher than the number of B12 deficient vegans. While this is true in absolute terms, it remains important to bear in mind that only 0.1-0.2% of the population are vegan, so of course total deficiency numbers will be higher for meat eaters. If you look at the percentages, however, it is clear that B12 deficiencies are much higher amongst vegans and vegetarians than other dietary types. 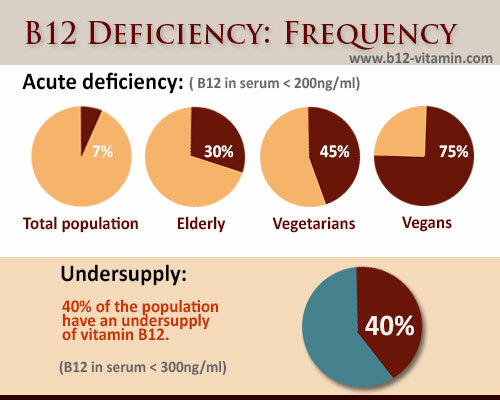 Around 7% of the total population are suffering from a lack of vitamin B12, yet between 60-90 % of vegans are deficient. Even studies carried out by vegan advocacy groups came to the same conclusion; bias can be ruled out (9). The risk of B12 deficiency faced by vegetarians is also quite high. The results of studies in this field are a little more diverse, concluding that anything from 20-70% of vegetarians might be suffering from a lack of B12, which means that half of all vegetarians are affected – significantly higher than average. It can therefore be regarded as a scientifically proven fact that vegan- and vegetarianism both increase the risk of B12 deficiency. The larger vegan associations promote awareness of this, since the high number of studies carried out on this topic leave room for no other conclusions. For this reason, it is all the more surprising that some vegan forums and articles downplay the serious potential health risks, most commonly in discussions concerning ‘natural diets’ as mentioned above. In these cases, the risk is often ignored and results in deficiency. Vitamin B12 deficiencies often go undetected for a long time before serious physical symptoms start to manifest. For many years symptoms such as fatigue, depression and minor mouth inflammations could be the only outward signs – but these are rarely identified as an indication of B12 deficiency. More severe symptoms might only first become noticeable after many years, which is why sufferers often believe incorrectly for a long time that they are fine. The second half of this article will detail how vegans and vegetarians can ensure they obtain an optimal supply of vitamin B12. It is also worth calculating how much B12 is taken in through food, to work out how much is needed in supplements. When it comes to dietary sources of vitamin B12, some ovo-lacto vegetarian foods contain enough B12 to cover at least some of the body’s daily requirement. However, this is assuming that there is no increased need due to malabsorption, for example, which is a major factor for many people. We believe that in most cases the intake of B12 should be significantly higher than the daily requirement, because not all ingested B12 is utilised by the body (as we have explained above). In our opinion healthy people need an intake around 4-5 times higher than the currently recommended daily amount. Those who have problems with absorption, particularly in the stomach lining, could require anything up to 300 times more than the suggest value. The many discussions regarding whether vegan diets can cover our B12 requirements have led to various theories and scientific studies. Fortunately, these have allowed the vitamin to be better understood. In the following, several reported and actual vegan B12 sources will be examined more closely. As an intermediary between dietary supplements and foods, there are B12 fortified foods. Examples of these include corn flakes, soya milk, soya yoghurts and puddings, juices, some meat replacement products, yeast extract and most energy drinks. The B12 content in each of these varies. Under current EU regulation it is prohibited to fortify organic produce. It is worth noting that most of the vegan and vegetarian population prefer to consume organic produce. The table below details approximate values for some of the above mentioned products, but the B12 content varies per manufacturer. It should also be noted that not all of the listed products always contain B12, only those that have been specifically modified. If in doubt, check the packaging or contact the manufacturer. Some of these enriched products can provide part of the daily requirement of B12 for vegans; as a sole supply however these foods will not be enough. Moreover, some remain under scrutiny due to the negative impacts they may have on health (e.g. energy drinks) and the biologically usable of their B12 content (e.g. fruit juice). Vitamin B12 is produced exclusively by microorganisms. Some of these bacteria are found in the human intestine and can produce large quantities of B12. However, this source cannot be relied upon, even if the body is taking in sufficient amounts of the vitamin and is in full health. There are only certain places in the body where B12 can be absorbed and these are via the oral mucosa in the mouth and in the small intestine. The majority of B12 secreting bacteria are found in the large intestine and at this point the possibility to be absorbed has passed. As a result, B12 produced in the large intestine goes unused and is excreted with the faeces. Additionally, the gut flora and the absorption capability of most people is so damaged that bodily produced B12 is not a suitable source. A self-produced vegan B12 supply occurs very seldom and is only possible under very special circumstances. For more information see the following articles: Vegan Vitamin B12 and Vitamin B12 and Gut Bacteria. These findings may provide a possible explanation as to why most herbivorous animals consume their own faeces at certain intervals. Like humans, all animals are dependant on an intake of B12. It was initially unclear how animal herbivores were able to meet their B12 requirements. While ruminants such as cows are able to maintain a sufficient supply of cobalt from self-producing bacteria in their rumens; other herbivores rely on a supply of B12 from their diets. Today it is assumed that this is achieved through sporadic consumption of their own faeces and through eating foods that contain microorganisms, soil and contaminated pieces of plant. These sources are not really viable for humans. Aside from the obvious health risks, it is unlikely that most people would be able to bring themselves to take part in such a practice. In good quality humus, such as that present on organic farms, B12 producing microorganisms can be found (10). By consuming unwashed and unpeeled root vegetables like carrots and parsnips grown in such soils, a significant amount of the vitamin can be obtained. The amount of B12 available from this method has not yet been investigated, as unwashed organic food is predominantly used in the home. Also there are a number of variables, such as soil quality and type of microorganism, meaning a general value would be hard to determine. It is unlikely that this source would cover the body’s requirement, but it could certainly make up a significant amount and constitute a valid source. In the past this might have been the case; today, however, as a result of poor soil quality and the widespread use of pesticides, it makes almost no contribution to the general population. No fruits or vegetables exist that are known to contain a significant amount of vitamin B12. Nonetheless, it has been shown that plants can absorb and store the vitamin, for example in lab experiments using a highly concentrated vitamin B12 solution or when fed with fertilisers that are very rich in the vitamin (11). Fruit and vegetables grown on strictly organic farms could therefore absorb amounts of B12 from fertiliser (e.g. cow manure), although this ultimately is a form of contamination. Reliable statements about the B12 content in organic crops are hardly possible, due to the high number of variables. Eventually fruit and vegetables could be farmed in such a way that their roots, tubers and partly their leaves contain decent amounts of B12 – but since it is easier to simply enrich foods there are currently no plans to develop this idea. It can be assumed that by eating organic foods small amounts of B12 will be absorbed. The scale in this circumstance might be about 0.1 μg/100 g and would be an unreliable and insufficient source, unless several kilos of raw vegetables are consumed daily. Nevertheless, eaten in conjunction with other vitamin B12 sources this could be another small way for vegans to avoid deficiency. Yeast (or nutritional yeast) does not naturally contain B12. The common misconception that it does is probably due to the fact that a few different yeast products are fortified, such as the most famous yeast extract, Marmite. This might also be because some nutritional yeast brands cultivate their produce in a special molasses culture medium and as a result the product contains small amounts of B12. Nutritional yeast produced in Europe does not contain B12, unless specifically fortified. Algae is central to the discussion on sourcing vegan B12. Some algae – specifically spirulina, chlorella and nori – are believed to be, and advertised as, excellent sources of the vitamin (12). In light of new research, just how usable these algae are as a B12 source for humans has become extremely controversial. The market for these products is highly lucrative and in this particular field there are multiple studies and counter studies; this topic should be handled with care. To understand how the idea that algae can be a rich B12 source, it is also necessary to comprehend the procedures used to measure content and levels in plants. In the past, microbiological methods were used to calculate B12 food content: with bacteria and algae the corrinoid content necessary for the growth of the vitamin was measured. A number of substances that share similar molecular structures come under the term ‘corrinoid’ – including B12. This method can only measure the total corrinoid quantity and not the proportion of corrinoids that are biologically available as B12/cobalamin. Today B12 content is measured by differential radioassay and more recently through IAC-HPLC (immunoaffinity column – high-performance liquid chromatography). These test are able to better differentiate between the vitamin and other corrinoids. The stated high levels of B12 in algae such as spirulina are the result of tests carried out by manufacturers using almost exclusively microbiological methods. In reality, these tests do not determine B12 content, but rather corrinoid content. When comparing these results to those from a radioassay, extreme differences can be seen. It becomes clear that around 80% of the alleged B12 content that was formerly measured was actually B12 analogues that are biologically inactive in humans (13). In addition to this, tests carried out by the Vegan Society concluded that spirulina is not a reliable B12 source, as it does not improve MMA levels. Studies have shown that although consumption of spirulina and nori temporarily increases the blood serum levels of B12 (although this test does not differentiate B12 analogues), patients’ MMA levels (metabolic product of B12 and clear indication for its presence) significantly deteriorated (14). This is often explained by the fact that high levels of B12 analogues will hinder the uptake of actual cobalamin, thus lowering the total absorption (Daniele et. al.). So far, studies suggest that only chlorella may actually be a legitimate high source of B12 (15). Until exact knowledge and conclusive studies are available on this topic, it should be assumed that algae are not reliably supplies of the vitamin. Further reading: Vitamin B12 and Algae. There are a variety of different fermented foods currently available, which have been cultured either through a fermentation process or bacterial cultures. Tempeh, sourdough, sauerkraut and beer are examples of such products that are considered a source of vitamin B12. Despite the wide belief that soy sauce, tamari and tempeh contain the vitamin, in tests they were shown to have no B12 content. It is unclear how this reputation was established. In the case of sourdough and sauerkraut there are no reliable values available. For sauerkraut, microbiological tests repeatedly determined a values under 0.5 μg/100 g, but the portion of this that represents actual B12 (not the analogues) is unknown. According to CMA, the content of the vitamin in beer is 0.8 μg/100 g. Whilst for obvious reasons it is not advised to consume large quantities of beer to obtain B12; drinking alcohol-free beer on a regular basis could make a small contribution to the overall supply. A few different values have been suggested for the B12 content in parsley, seabuckthorn and wheatgrass juice (16). It remains unclear whether the content is a result of contamination and how high the actual B12 level is. It is most likely that contamination is the cause for any B12 content in these three plants. The company Dr Pandalis sold seabuckthorn B12 capsules for many years until they were forced to release a statement revealing: “seabuckthorn produced by our organic farmers has not been shown to contain vitamin B12 for around the last four years”. The soil conditions had changed so much over the years, that B12 no longer accumulated in the seabuckthorn – an example of the unreliability of B12 content in plant produce. Despite this revelation, the rumor that seabuckthorn can be a reliable source of the vitamin has remained popular. In the meantime, replacement sources containing small amounts of B12 have been found. Wheatgrass and other sprouts belong to a group that have produced positive findings to suggest that they may indeed be sources of B12. However, at present there is not enough reliable information surrounding this topic. Again, it is unclear how much of this B12 comes from the soil – it is likely to be another result of contamination. Based on current knowledge, a vegan supply of B12 is very difficult (if not impossible) to obtain. Organic fortified foods are not available, which rules them out as an option for many vegans. It is also not always clear which form of cobalamin the food contains, and how it might react with other ingredients. This is certainly the case for multivitamin fruit juices, in which it is questionable how biologically usable the contained B12 is after coming into contact with high doses of vitamin C and other acids. With this in mind, we would support the advice of the Vegan Society, who recommend taking B12 supplements if you follow a vegan diet; it is the only secure way to avoid deficiency. Supplements may not be cheap, but they are also not too expensive. What is more, dosages are easily measured and an overdose is almost impossible. Plus, quality of life and vitality often increase drastically when the body’s B12 supply is increased. For vegetarians, the specific composition of the diet play a key role. Those who want to make sure they are not at risk, can conduct a vitamin B12 deficiency test. Are Vitamin B12 Supplements Vegan? Vitamin B12 supplements are produced in bacterial cultures, which are almost always vegan (17). The nutrient medium is usually vegan as well. It is commonly thought that B12 is obtained from animal organs, but to manufacture supplements in this way on a large scale is ruled out for practical reasons. Nevertheless, if you are vegan it is important to check that the supplements you choose do not contain ingredients such as lactose or gelatine. According to wikipedia, some manufacturers want to use genetically modified bacteria to culture B12, as it can apparently produce an increased amount of the vitamin. Unfortunately, there is no actual evidence for this; only the respective manufacturer can further clarify the matter (18). Judy McBride (2). “B12 Deficiency May Be More Widespread Than Thought”. Agricultural Research Service. United States Department of Agriculture. Retrieved 2 July 2012.